Take Along Tunes Musical Toy is rated 3.6 out of 5 by 16. 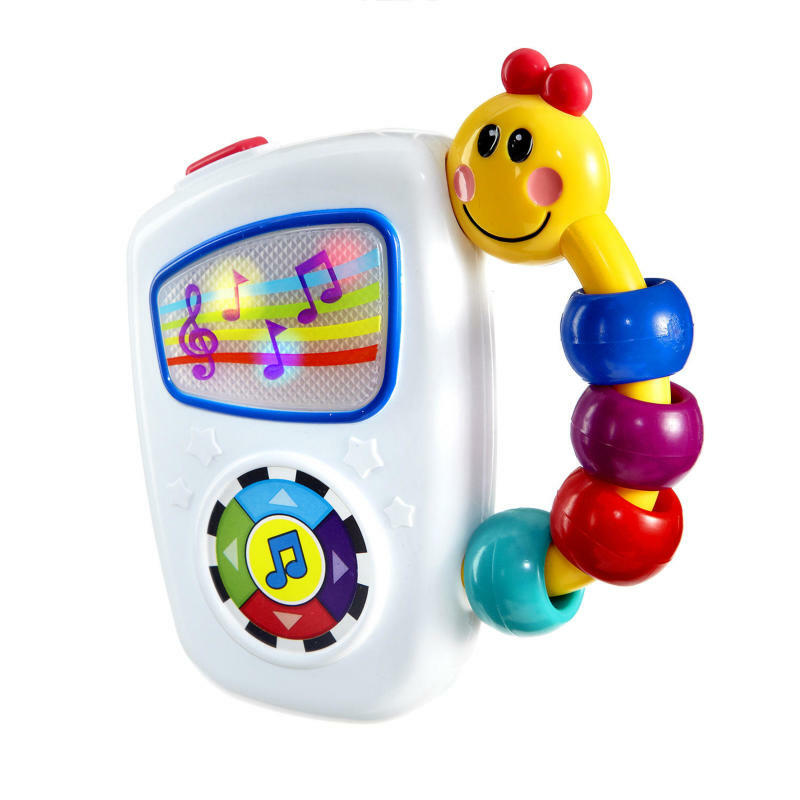 The award winning Baby Einstein™ Take Along Tunes Musical toy is made for little maestros. This easy to grasp, on the go toy is your little musician’s opening act and will quickly become a favorite. It’s important to give your baby toys that play music to foster music appreciation at a young age. With the Take Along Tunes musical toy, babies can use the large button to toggle their way through recreated classical masterpieces from Chopin to Mozart and more. Colorful lights dance across the screen to the rhythm of each melody, captivating your baby while encouraging both auditory and visual perception. Dimension (in) 5.125" x 1.08" x 5.125"
Rated 1 out of 5 by Mackenzie from Lasted for 4 weeks We bought this toy from target after a friend came over and had it for her 4 month old. I loved how engaging it was with the lights and music but so transportable. My twin girls loved it! Sadly it died 3 days ago, after only having it for 4 weeks. Tried replacing the batteries and that didn’t work. Rated 5 out of 5 by MMsMom from Best Hand Held Music Box! This little portable music box has the best songs that can sooth and entertain my 1 year old. She enjoys all the lights and music that plays. She uses her little fingers to spin the beads and can nibble this without any small pieces falling off. This product is almost indestructible and made of excellent quality! Great entertainment for a small price. We’ve had this for close to 6 months and have not needed to replace any batteries as well. Rated 5 out of 5 by BarbAC from Take along Tunes great The Take along tunes was bought for my new grandson, but babies who also visited our home loved it. The music is great and entertains my grandson who is under 3 months. My daughter takes it in her diaper bag wherever she goes! Rated 2 out of 5 by Msodo from Great while it lasted My baby loved this toy but it stopped working after 7months. Rated 1 out of 5 by JenniferHolland from Never Worked Received this as a gift for my son. It made a terrible screeching sound so I changed the batteries out. Now it won't even work at all. Rated 3 out of 5 by BrandyLS from Decals Wear Almost Immediately I bought two of these for my twin boys. They love the music and the toy is nice and sturdy. I like the fact that it has volume control. As with another toy I have reviewed, my biggest issue is the decal wearing. This toy is for the "teething age group" and everything goes into my boys' mouths. I try to take good care of our toys and it is disappointing that such a nice toy has the decal coming off only after a couple of weeks of use.